My friend recently posted a status about how hard it was to enter her first football season without her dad. He's been gone for months...but Dallas Cowboy football is one of the most recent "firsts." All those things that you never realize are shared experiences or their emotional significance until you go through them without the one you've lost. Then suddenly, this memory becomes a neon sign glaringly pointing out what is now missing. I read her status and one image came to mind. Work coveralls. Work coveralls are my neon sign. The thing that can interrupt an old ordinary day and bring a sharp prick to my heart. Because it's a reminder. My dad could never have been accused of being fashion conscious. Perhaps twenty years of military uniforms left him incapable. I don't know. 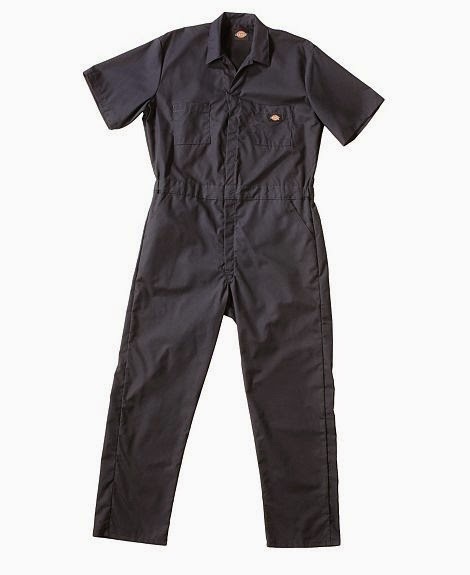 I just know that my entire life, these work coveralls were my dad's at-home uniform. He'd slip them on to do yard work or work around the house. And I would secretly roll my eyes. Or maybe not so secretly, come to think of it? Yes. I was indeed a bratty know-it-all teenager who was mortified at my dad's lack of fashion sense. Yet, I still cannot see someone in these overalls without missing my dad. And he's been gone twenty-four years. My own personal experience makes me hypersensitive to these neon signs of others. Because if you've lost a loved one, there are these random and unexpected things that point in flashing lights to your loss. And while the world around you continues to move forward, these neon signs bring it all back. A sight. A sound. A song. A scent. I've found that these neon signs are rarely things that cross your mind at the onset of your grief. But, they flesh themselves out as the days and months pass. When they suddenly show up and you have to inhale sharply. Because you are so caught off guard. Most people don't warn you about these things. I suppose that's why I'm writing this post today. To let you know what might come...that you will likely be blind sided. I won't pretend that this warning will ease the pain. But at least maybe I can normalize this for you. Let you know that if truth be told, we all have these neon signs. All of us, who have trudged through the muck and mire and quicksand of grief. And when they hit you, you can rest assured that I won't laugh or belittle your Dallas Cowboy game if you won't laugh at my work coveralls. No, we can stand together and pass a tissue when these very random and odd things appear in our days. And if you are fortunate enough to have never walked the road of grief, then you are really who I want to talk to today. Because you need to know. You need to understand that neon signs exist. They flash and point to the missing pieces for those who grieve. And I need you to do me a favor. I need you to have grace and compassion when your friend's eyes suddenly well up with tears because her mom used to bake that exact kind of cake. Or because that baby shower taunts her about the baby she lost--or has never been able to have. Or when that hymn is sung and all she can hear is her dad's off key voice singing it loudly as he used to do. I need you to have grace and compassion and not avoid these neon signs. Even if it's been months or years and you had honestly forgotten about their grief. Because you have that luxury when you aren't learning to walk through life and create a new normal. Just as you would not patronize an amputee, secretly rebuking them for STILL mourning that arm they lost and all that they will never do again. Don't ignore or gloss over the pain of someone who grieves. Because grief is ongoing. Grief comes when someone dies, yes. We all know that. But we can forget the grief of someone who battles infertility. Or whose dreams for their life have actually never come to fruition, whether it be a career or a marriage. Mothers and fathers grieve when their children are diagnosed with a special need and the rest of their life changes. Certain rituals and rights of passage will never come to be. These are their neon signs. On an ongoing basis. Dating. Extracurricular activities. College. Marriage. There are parents whose children are diagnosed with mental illness and new battle lines are drawn because it's an ongoing fight. While you complain about your child who didn't take out the trash, they are fighting much bigger battles for survival that can overwhelm them. They may wish their biggest struggle was getting their teenager to take out the trash. And it's not your job to not be real or authentic about your struggles. But it is your job, as their friend, to be sensitive. To keep in mind that neon signs may be invisible to you, but not to them. So remember the ongoingness of grief. The lifelong journey it becomes for those who have lost and now mourn. You don't have to be hypersensitive to it. But do be sensitive. Remind yourself to check in on them regularly--putting the anniversary of the loss on your phone as a reminder. Or watch for that change in facial expression when your friend is suddenly fighting back tears. Then don't ignore the elephant in the room. Wrap your arm around them and let them know you're in it for the long haul. And for the record, don't shy away from mentioning it because you don't want to bring it up and remind them. I can assure you that it's rarely NOT on their radar. And being bold enough to validate it can go a long way for a person who might feel alone, as their neon signs are rarely in "off" mode. It's been a long time in my life since that huge loss. I want to offer this word of encouragement. I used to run the opposite direction when I saw an older man in work coveralls at the store. I have been known to stay home from church on Father's Day or the Fourth of July church service, since my dad was such an incredible patriot. I used to avoid any movie with a plot line involving cancer. These were things I could not bear. And I learned to recognize these neon signs and give myself the grace to be affected by them. While my neon signs haven't gone away, somewhere along the way, the sweetness began to take over the bitterness of these bittersweet reminders. I may still tear up, but it brings more of a smile to my face now than an ugly cry. More of a dull ache than a sharp pain. More like a God wink from heaven to remind me of what I was blessed to have instead of the overwhelming pain of what I have lost. And all in all, these subtle changes along the way in my own grief journey have made me realize something. I no longer dread the neon signs. I've learned to co-exist with them. I've even learned to embrace them.